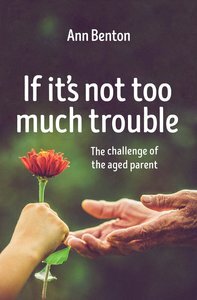 About "If It's Not Too Much Trouble (2nd Edition)"
Ann Benton has written books about the modern family including Aren't they Lovely when they're asleep? (about parenting), Teenagers: Biblical wisdom for parents and co-wrote Don't they make a lovely couple? (about marriage) with her husband, John. John and Ann are in demand for seminars on marriage and family enrichment. For several years Anne chaired the London Women's Convention.